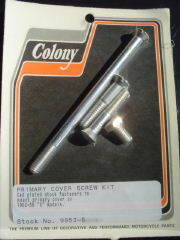 Primary cover screw kit for 1952 - 1956 K Models. Available in Chrome plated and Cadmium plated versions. Select the needed application from the option menu below. Colony Stock # 9852-5 and 9853-5.